Leave Piazza IV Novembre by Corso Vannucci and turn left into Via Fani, which is named for Cesare Fani, a Perugian who fought with Garibaldi as a young man and who then went on represent Perugia in the National Assembly of Italy from 1886 until his death in 1914. ✴A black and white mosaic (ca. 50 AD) with geometric design that was excavated from a Roman house here in 1918 is now in the entrance cloister of the Museo Archeologico. ✴An inscription (AE 1979 246) on what was probably the base of a statue was found here in 1915 is now in another room the Museo Archeologico. It commemorates Aulus Atilius Glabrio, son of Lucius, one of the last quattuorviri of Perugia and dates to the period after the destruction of Perusia by Octavian in 40 BC..
A plaque on the wall of the neo-Romanesque Casa Ajò on the right records its restoration in 1917 by Ugo Tarchi. This road was widened in 1911 when the Palazzo delle Poste was built on the left, at junction with Piazza Matteotti (see Walk II). Turn left here and cross the piazza diagonally and to the left. There was probably a gate in the Etruscan walls at a point close to the start of Via Alessi ahead. 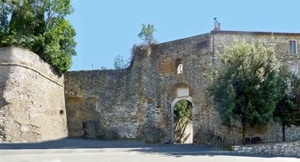 The suburb outside this gate, later Rione di Porta Sole, began to develop in the 12th century. Walk along Via Alessi, which descends quite steeply, past Palazzo Ranieri at number 1 on the right (next to the Chiesa del Gesù, which is described in Walk II). A stretch of the Etruscan walls can be seen at the back of the shop at number 26 on the left, and Palazzo Ansidei di Catrano is at at number 27, opposite. Take a short detour by turning right along Via Angusta. An inscription on the wall of what is now Ristorante Paiolo (behind Palazzo Ansidei) records that Luisa Spagnoli opened the first "Perugina" chocolate factory here in 1906. Return to and continue along Via Alessi, passing an interesting stone tower house at number 41 on the right. The road then leads to San Fiorenzo. The door by the column in Via della Viola, to the left of the church, leads to what is now the University of the Third Age: if it is open, you can see the 15th century cloister of what was the monastery attached to the church. Walk back and across the facade of the church, and then turn left along Via Bonaccia. Take a short detour by following it as it becomes a stepped street to the right, down to Porta Santa Margherita. Continue down the steps, turn right along busy Via XIV Settembre, which was built outside the walls in 1822. It is named for the day (14th September 1860) on which Perugia became part of the Kingdom of Italy. Take the second underpass into Parco Santa Margherita. ✴an elaborate cross at number 19. The ex-Oratorio dei SS Simone e Fiorenzo is at number 41b, followed by the church of San Simone del Carmine, also known as SS Simone e Giuda (at the extreme left in this photograph). Take a short detour along the stepped Via del Carmine opposite, which leads to the tiny Piazza del Duca. The portal on the left belongs to Palazzo del Duca (late 16th century), which extends along two sides of the piazza. The palace belonged to the important della Corgna family: they had a chapel in San Simone del Carmine and also donated its organ in 1602. Return to and turn left along Via Imbriani, which now becomes Via dell’ Asilio, and which leads to a low arch that was once Porta del Carmine. The towers built into numbers 18 and 25 were part of the fortifications built here in 1516. The gate was largely destroyed in 1822 when Via XIV Settembre was built outside it, and is now reduced to the role of entrance to the underpass by which pedestrians can cross this busy thoroughfare. Walk through the underpass to the other side of Via XIV Settembre. 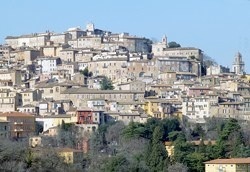 There is a fine view of Santa Maria di Monteluce (see below) in the distance. Continue along Via Enrico dal Pozzo, which traverses the suburb known as Fontenuovo, which is named for a local fountain (see below). The road itself is named for the scientist Enrico dal Pozzo (died 1892) who owned the large house on the right (number 59-93) that is now the Residenza di Ospitalità per Anziani di Fontenuovo. Pope Leo XIII arranged for the purchase of this property in 1885 and established an old people's home under the care of a French religious community, the Piccole Suore dei Poveri (the Little Sisters of the Poor). 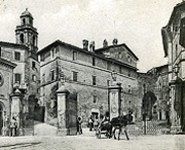 The ex-church of San Crispino is opposite, at number 88 on the left: the adjoining hospice (15th century) was destroyed by subsidence in the 19th century. The imposing portal of the Casa di Ranaldus Ridolfinus is at number 93 on the right, at the junction with the Via di San Simone del Carmine. The medieval fountain that gave its name to this area is further along on the left. According to tradition, St Francis used this fountain in the 13th century as he passed through Perugia. However, the earliest surviving documentary reference to it dates to 1494. A small church known as the Chiesuola di Buon Riposa that was built nearby in honour of St Francis was demolished in 1850. The buildings of the Clinica Neurologica del Policlinico di Perugia beyond stand on what was the site of the Capuchin convent of Santa Maria della Pace. The Benedictine nunnery of San Bernardo stood across the road here from at least 1326 until 1399, when Pope Boniface IX ordered that it should be absorbed by Santa Margherita. Continues to San Bevignate on the right. This interesting church and the remains of a Roman domus below it can be visited at weekends, by appointment. The entrance to the Cimitero Civico (cemetery) is a little further along on the left. The church of Santa Maria delle Grazie is further along on the right, beside the pedestrian bridge over the road. It now acts as the cemetery church and can alternatively been reached from the cemetery. Retrace your steps along Via Enrico dal Pozzo and turn right into Via Giochetto. After the roundabout, at number 5, is the ex-nunnery of San Paolo di Favarone. The road continues to the Piazza Monteluce. This piazza stands on the hill of Monteluce, which was inhabited from at least the 8th century BC and which was probably so-named in Roman times for a sacred grove (lucus). The piazza is dominated by the façade of the church of what was the important Franciscan nunnery of Santa Maria di Monteluce (which you saw from Via XIV Settembre, earlier in the walk). The site of the nunnery to the right and behind it served as the hospital of Perugia from 1910 until 2008 and is now the subject of ambitious development plans. ✴A krater (330 - 300 BC) decorated with the scene of Hercules and the Amazons was found in 1853. ✴Three warrior tombs (4th century BC) were excavated here in 1887. ✴Further discoveries were made during the works for the General Hospital in 1927. 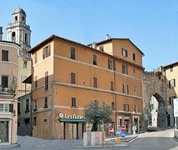 Leave the piazza along Via Cialdini, the stepped street directly opposite the church. It is named for Enrico Cialdini, the leader of the Piedmontese regiment of Bersaglieri (light infantrymen) who marched through Porta Sant’ Antonio (below) to liberate Perugia on 14th September, 1860. The remains of three of the medieval shops that once lined it stand to the left of the steps. Continue to the junction with Via Pompili on the right. You will be turning here, but take a short detour ahead to the junction with Via Brugnoli, which is named for the artist Annibale Brugnoli (died 1915). This was the site of a bastion of the Cassero di Sant’ Antonio, which formed part of the Fortezza di Porta Sole. Its brick reinforcement dates to 1516, when Duke Francesco Maria della Rovere of Urbino threatened Perugia. ✴Grave goods from one or perhaps two rich tombs (ca. 300 BC) were discovered in 1927 in Via Madonna della Riccio are now in the Museo Archeologico. ✴The Ipogeo dei Cai Catu (3rd - 1st centuries BC) was discovered in a garden near the junction of Via Guido Pompili and Via Madonna della Riccio in 1983 when a gardener penetrated the vault of its vestibule. This hypogeum, which is one of very few Etruscan burial sites to have been scientifically excavated in its undisturbed state, has been faithfully reconstructed in a room in the museum. Follow this winding road, ignoring the private roads off it. A sign near the end warns of a 26% descent, but there are steps to help. Turn left at the end and continue along the busy Via Eugubina to the roundabout at which it joins Via San Giuseppe. Across in front of you is a signpost to Sant’ Erminio, which directs you to a short lane to the right that leads you to the nunnery of Santa Maria di Monteluce in Sant’ Erminio. This complex provided a new home for the nuns from Santa Maria di Monteluce (above) in 1927. Their church is still open for services, and you might be rewarded by the sound of their choir. Walk back along the lane and continue straight ahead along Via San Giuseppe. This is named for the small church of San Giuseppe (1695), which is on the right at number 18. This road leads to Porta Sant’ Antonio. The inscription on the outer wall above the arch records that the forces of King Victor Emanuel II were acclaimed by the people of Perugia as passed through this gate on 14th September, 1860, after the city’s recovery from the massacre of the 20th June 1859. The road from the gate into the city was renamed as Corso Bersaglieri in 1871 in honour of this regiment of Bersaglieri (light infantrymen), which was led by Enrico Cialdini (above). This road forms the spine of Borge Sant’ Antonio. Walk through the gate and along Corso Bersaglieri. A truncated Roman column in the small piazza on the left supports a stone pig (15th century) that is the symbol of St Antony Abbot. 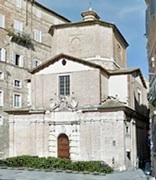 The left wall of the church of Sant’ Antonio Abate is above it; the campanile of the church is high up to the left; and the entrance to the church is reached from the small courtyard further along the road, at number 101. (It is behind the loggia on the left in this photograph). ✴the Oratorio di San Giovanni Battista at number 31. Retrace your steps a little way along Corso Bersaglieri to Via Cane on the left and follow it as it turns right and then left, along two sides of an electricity substation. It ends at a viewing point that was opened in the city wall in 1968. The Rione di Porta Sant’ Angelo (see Walk V) stretches out in front of you on the other side of the valley. The inner side of the wall here still has the buttresses that were built to support the fortified corridor that linked the fortress at Porta Sant’ Antonio (see above) to the Fortezza di Porta Sole. Walk through the gap in the walls and turn left along them, following signs for the pedestrian route to Porta Pesa (see below). This view of the walls along which you are walking illustrates the path of this corridor connecting the two fortresses. The path leads round the back of the ex-nunnery of San Tommaso (see below), the campanile of which can be seen in this photograph. This path then leads to an open terrace, with the Officina per la Scienza e la Tecnologia (POST) on the left. The wall continues along the edge of the terrace, with a fine view of Sant’ Agostino (visited in Walk V) ahead. ✴Pintoricchio’s house is at number 47 (across the road and to the right); an inscription recording the fact is in the wall above what is now a Chinese restaurant (illustrated here). ✴The cloister of the ex-convent of Santa Maria Nuova (see below) is at number 87. ✴The entrance to the ex-nunnery of San Tommaso is immediately on the left, at number 62. Continue along Via Pintoricchio, passing the Oratorio della Confraternita del Santissimo Crocifisso on the right, to the adjacent church of Santa Maria Nuova. (The oratory is entered from the church and described on the same page). The arch ahead on the left is the Arco dei Tei. Take a short detour by walking through the arch into Largo di Porta Pesa, which was named for the now-demolished Porta Pesa. The postcard illustrated above, on the right, depicts the customs barrier that replaced the demolished gate in the 19th century. Return through the Arco dei Tei and continue along Via della Roscetto, which runs along the right wall of Santa Maria Nuova. The ex-Oratorio di San Benedetto is on the left at number 21. Continue up the stepped Via Bontempi to Porta del Giglio. This originally Etruscan gate is described in Walk II. The stretch of Via Bontempi beyond was widened in 1547 by Cardinal Tiberio Crispo. Continue along it, past the ex-church of Santa Maria Maddalena at number 21 on the left and Palazzo Rizzoli (16th century) beyond it, at number 17. The arch between Santa Maria Maddalena and Palazzo Rizzoli leads to a courtyard with one portal in front of you and another to the left. Each of these portals had the arms of the Olivetans on its lintel, but these were subsequently removed. An inscription on the left records that this was the location of the Tipografia Benucci in the period 1884-1984, and that the first electric printing press in Perugia was installed here in 1903. The tower house at number 28 belonged to the Canons of San Lorenzo, and has a relief of the martyrdom of St Laurence on its loggia. A similar relief appears on the lintel over the door to number 22, further along on the right. Continue past Palazzo Baldelli Bombelli (1644) at number 11 on the left. There is a stretch of the Roman road in its basement. ✴the Chiesa della Compagnia della Morte, which has its facade in Piazza Piccinino. 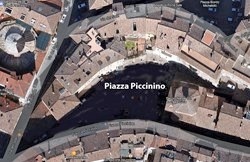 Walk into Piazza Piccinino, which was so-named in 1871 in honour of the Perugian mercenary Nicolò Piccinino. Simone Sisani (referenced below, at p. 293) suggested that this was the site of a Roman theatre (although the only evidence for such a monument is the semi-circular form of the piazza). Piazza Piccinino took on its present form in 1547, as part of the urban regeneration initiated by the papal legate, Cardinal Tiberio Crispo. He demolished the ancient church of Santa Lucia, which was documented here in 1052, and built a new church with that dedication (Santa Lucia delle Volte) in what is now Via Volte della Pace. The terrace to the left of the Chiesa della Compagnia della Morte (as you turn to look at its facade) sustains what is now Piazza Michelotti (see Walk II), which formed part of the Fortezza di Porta Sole. Until the Second World War, the well (15th century) in the piazza was, like its predecessors, fed by water from the Pozzo Etrusco (below). Palazzo Bourbon di Sorbello (at number 9 Piazza Piccinino), which was built above this Etruscan well in the 16th century, is now an important house museum. The inscription (1639) on the wall to the left of Palazzo Bourbon di Sorbello records that the Oddi family (then its owners) had rights over the piazza and its well. Continue past Palazzo Salvatori (17th century) at number 13, which appears with a frescoed facade in photographs taken in the late 19th century. Continue past the entrance to the Pozzo Etrusco at number 18 Piazza Danti ((also visited in Walk II). Continue into Piazza IV Novembre, where the walk ends.